Best Ever Chewy Chocolate Chip Cookies – soft, chewy and just like what you would get from a corner bakery but better because they come straight from your oven. My family loves these cookies, especially my hubs. Which is kinda a cookie miracle since he literally is uber picky about cookies. He really only likes cookies with almond extract, lime zest or a ton of pecans. So the fact that he loves these literally blew me away. 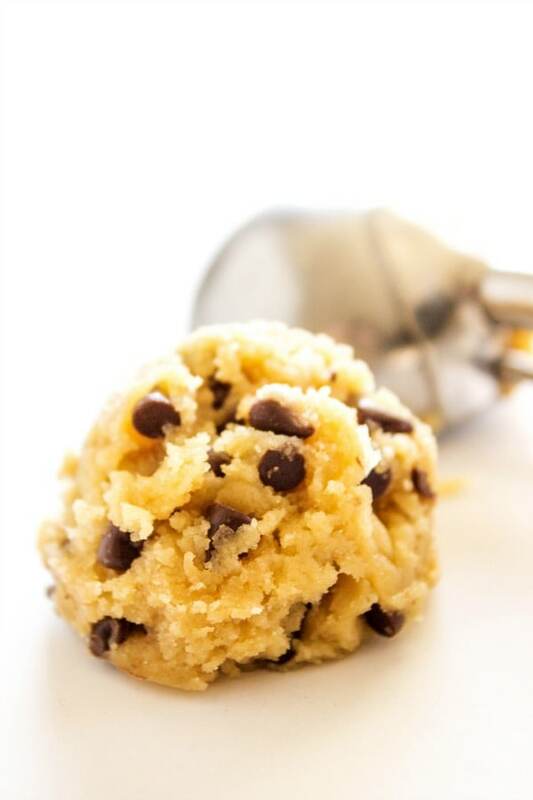 I love cookies as well but more of a cookie dough fan. 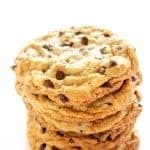 With these Best Ever Chewy Chocolate Chip Cookies I would actually preserve the cookie dough to have more cookies. It’s true. I love that with these cookies you get a nice chewy center with a slightly crisp outer edge. You could easily use mini-chocolate chips to get more of the cafe look for the cookies, but for me, I love using just regular chocolate chips. I love the big chunks of chocolate. Here is the secret to these little bites of deliciousness. Cornstarch! Substituting some of the flour with cornstarch makes, the cookies softer and lighter in their texture. Not sure if you have ever used the cornstarch trick in your cakes as well, I recently just started this but you substitute 1 tablespoon of flour for 1 tablespoon of cornstarch and this makes cake flour. Making your cake light and fluffy! So doing this in cookies, has the same effect. I love chocolate chip cookies. For years, I have been trying new things and ways to perfect them. Of course, when doing this I always think of that Friends episode of Monica losing the recipe that Phoebe gave her, that was her grandmother’s recipe for the best ever chocolate chip cookies. Monica spent hours trying to recreate it and then Phoebe remembers it is on the back of the Nestle Toll House bag of chocolate chips. 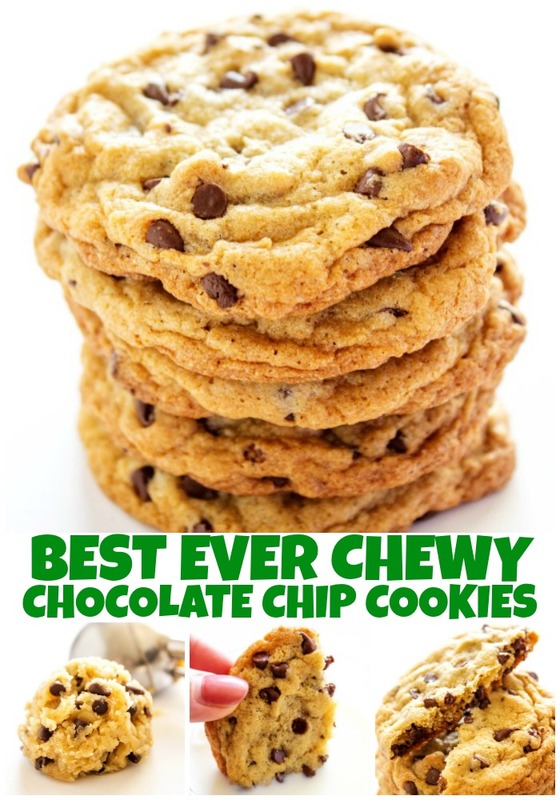 My favorite kitchen items I used to make these Best Ever Chewy Chocolate Chip Cookies. SHEET PAN: I love using a larger sheet pan while cooking because I am feeding my family of seven. I love aluminum for when I do sheet pan meals. I would start with this 13 by 18 half sheet pan. I love these pans so much that I have 9! KITCHENAID MIXER: I love my Kitchenaid mixer and use it almost daily. I have many recipes that I can use my KitchenAid to reduce prep time. I have two that I couldn’t live without. MIXING BOWLS: I love having a variety of sizes of mixing bowls. From small to large, I find that having at least 3 bowls of different sizes have been essential in my kitchen. I prefer Pyrex because of the durability. 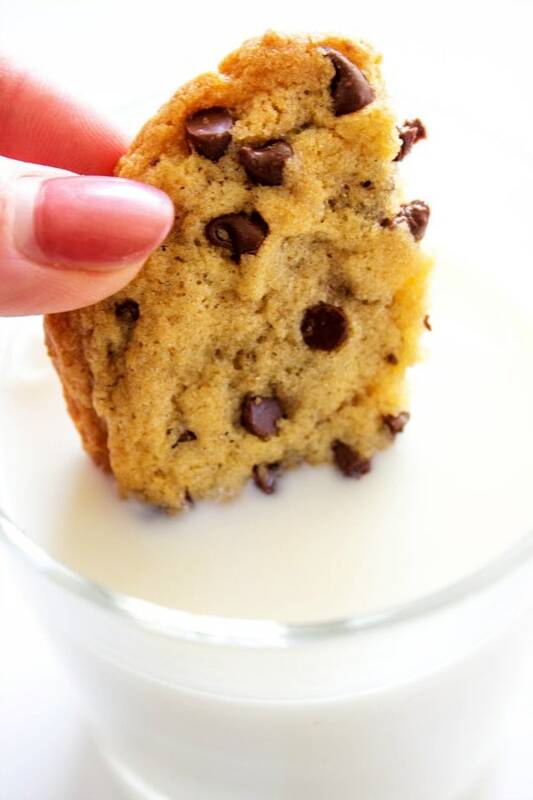 Don’t forget to pin this for Best Ever Chocolate Chip Cookies to your favorite Pinterest board for later. Best Ever Chewy Chocolate Chip Cookies - soft, chewy and just like what you would get from a corner bakery but better because they come straight from your oven. Melt butter, I did this in my microwave for 45 seconds. Be sure to cover with a paper towel when heating the butter in the microwave or it will splatter. In a small mixing bowl combine flour, salt, baking soda and cornstarch and stir to combine, set aside. Allow butter to cool to room temperature, then in a large mixing bowl add butter, brown sugar and sugar. Cream using a hand mixer, for one minute or until completely smooth and light. Beat in eggs and vanilla to butter mixture. Add flour mixture to the butter and sugar mixture. Mix until well combined. Cover dough, I used tin foil and set in the refrigerator. Allow to chill for 1 hour, sometimes I am not patient enough and only set it in there for 30 minutes and the cookies are just fine. And to be honest sometimes I don't even chill, I am too hungry. Scoop dough and place on baking sheet 2 inches apart. Place in preheated oven and bake for 12 minutes, or until edges are a nice golden brown and center is still soft. Don't over bake! You want a chewy cookie. Allow to cool for a few minutes, then devour. You may need to make more than one batch they are so that good. Great recipe, but you don’t mention when to add the chocolate chips. Just made the cookies 🙂 They’re pretty good. I did some healthy tweaks though: whole wheat flour instead of white, only cup of brown sugar none white and a bunch of walnuts. I’m keeping the recipe. I found this recipe on Pinterest and I’m making these cookies for the first time. Two comments/questions. I noticed the recipe never says when to add the chocolate chips. I assume to stir them in after adding the flour. Also, should the ingredients list say 2 cups flour MINUS 2 tablespoons? In the post you mention substituting some of the flour with cornstarch, and the ingredients calls for 2 tablespoons of cornstarch, so I assumed I was supposed to remove two tablespoons of flour (which would be substituted with the cornstarch) rather than add two tablespoons of flour to the 2 cups. The ingredient list reads + meaning add two tablespoons of flour. So don’t subtract any flour. ❤ and yes stir in the chocolate chips after combining the flour and butter mixtures. How many grams is 11/2 sticks of butter? 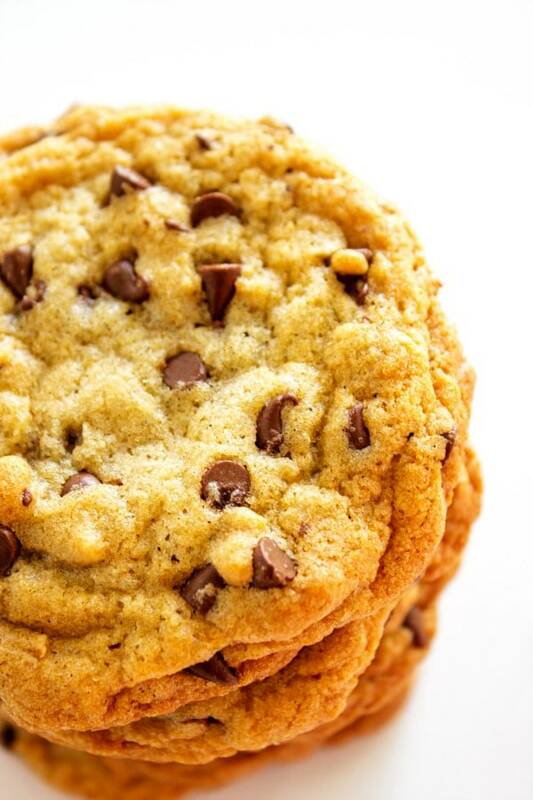 I love a good chocolate chip cookie! These look so soft and chewy! They are! Hope you like them! Looks SO good!! These will quickly disappear in my house! They definitely go fast here! Thanks, enjoy! I cant wait to make these with the kids! They will totally love them, enjoy! 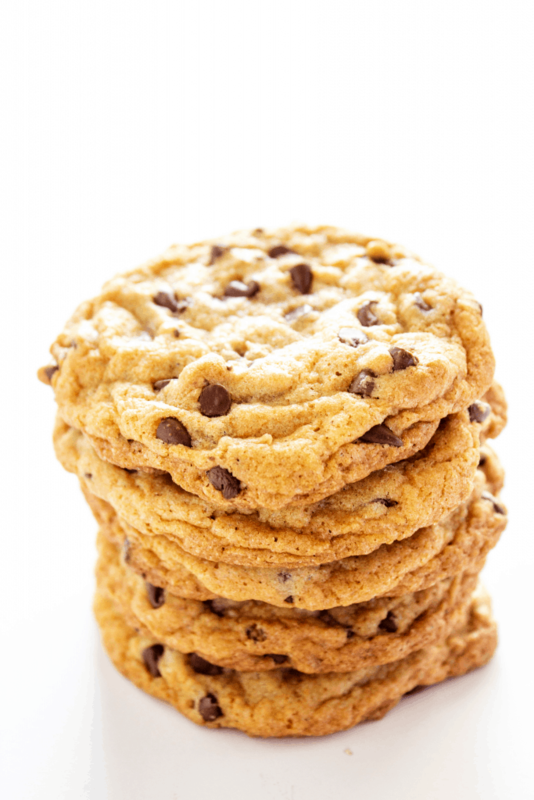 All I need is a stack of these cookies and a large glass of milk! Perfection! That’s definitely the perfect combo! Enjoy! I would have to double the batch for it to last 10 minutes in my house! Not a bad idea, they definitely tend to go fast for sure! Enjoy! I love the texture of these cookies! Yummy! I rarely bake cookies because my family prefers chewy ones, and most homemade ones are crispy and dry. I made these yesterday and one of my kids texted me just now from work and he said “Hey Mum, the cookies are dynamite! Thanks!” My hubby said they remind him of Cookies By George 🙂 Great recipe, it’s a keeper. Oh….and I didn’t refrigerate the dough, they turned out perfectly. Thank you for sharing your recipe! That’s awesome! So glad to hear they enjoyed them, thank you!